Every once in a while I come across something someone has written that expresses my passions and philosophy more eloquently than I can ever hope to articulate here. Therefore I feel that it must be shared on this blog. The author of this essay was one of my farm subscribers last year who worked for part of her CSA share. 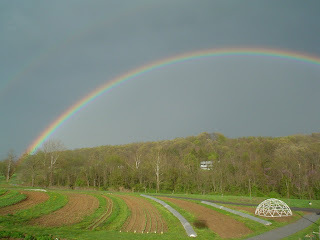 One of the joys of operating a CSA farm is the realization of the truth that my farm and my business belongs, not just to us, but also to those who become actively involved, either as work share participants on the farm, or as volunteer help with the annual CSA organization process. Something similar can also be said on behalf of those who support our farm in other ways with their patronage. Without their contribution, the successful operation of this farm would probably be impossible. When I include the thoughts and words of others as a part of my blog, the blog becomes not just mine but theirs also. I like to think that when I include their contributions, the blog becomes that much the better than it would be if I was trying to do it all myself. I am not a gardening expert. I am, in all honesty, a fairly lousy gardener! But I do work at it, and if my actual garden fails to measure up to the orderly, weed free, and well mulched cornucopia of abundance imagined in my head, there is probably a good lesson in there somewhere. Here are five good reasons to garden. Gardening is a peaceful protest—my response to all that is ugly in the world; all that is cheap, easy, and gas guzzling; all that comes wrapped up in plastic after being shipped 3000 miles across the planet; all that causes cancer, social injustice, and oppression. Gardening keeps me hoping. It often delivers on its promises, such as the summer when our Tarahumara sunflowers reached mythological heights. In autumn we feasted on squashes and late harvested vegetables, and during the winter my fifteen quarts of salsa nourished us and warmed our tongues. Gardening is, by its nature, grounding. There is nothing like physical work with our hands to bring comfort in times of disappointment. Anger can be a force for good, giving my measly 103 pound frame an extra punch as I throw my weight upon my shovel and churn up the dirt. Digging is hard. After a couple of hours, dirty, sweat-soaked, and stinky, I feel cleansed. I ache with a good kind of ache. To grow a garden is to marvel at creation. I drop tiny brown wrinkled things into the ground and every time I feel surprised when something eventually sprouts. I get so excited that I call my children and point to the tiny dicot leaves. “Look, our food is growing!” I say. We stoop down to admire its tiny new life, its persistence, its goodness. Finally and most importantly, I garden for love. I love digging and the smell of rich earth. I get a kick out of compost—nothing wasted, just re-allocated, renewed, and regenerated. No death is so great that it cannot serve yet another life, another body. I am forgiven for letting those vegetables sit in the fridge until they rotted. Worms, soil, and detritus work together to make yummy vegetables and beautiful flowers. Gardening makes me strong, healthy, and whole. It is a relationship of reciprocity—I feed the garden and the garden feeds me. The food that the garden gives to me is physical, tangible, and tasty but it is also spiritual. Gardening helps me to love God, who becomes less of an abstract theological construct and more the Surprising, Creating, and Sustaining force that I really do believe in. The fruits of the garden nourish those I love—family, house guests, neighbors, and friends. Eating home-grown produce together is love in tangible form. Anna Maria Johnson lives and gardens with her family near Broadway, Virginia. What Does It Feel Like to be an Old Man? A few weeks ago I quietly joined the ranks of that segment of our population identified by a variety of monikers—senior citizens, the elderly, old folks, geezers, etc by passing my 60th birthday. I remember when my dad had his 60th birthday roughly 30 years ago. One evening as I was milking the cows I answered the phone to find one of my aunts on the other end. Expecting my dad to answer, she yelled brusquely into the phone, “How does it feel to be an old man?” My dad had a gravelly voice which I could have easily faked and I have always regretted not playing along with her a little and having some fun. It did indeed feel like my life started going downhill as I entered the 40s seeking physical therapy treatment for chronic back problems and, a few years later, I began a gradual descent into a vaguely defined environmental illness which expressed itself in a manner similar to chronic fatigue syndrome. Fortunately, as one grows older and his physical capacities begin to wane, another force, the accumulation of hard won wisdom, is kicking in and that helps to level out the descent. By that time I had learned that I was strong enough to injure myself, that it really is a good idea to eat healthy foods and to protect oneself while working in dirty or toxic surroundings, and that it makes a lot of sense to work smarter instead of harder. By applying some of these principles, I eventually found the downward slope becoming more gradual and less slippery and at times even ascending a little once again. It has now been 20 years since I crossed life’s summit and mathematically speaking that works out to half of the time it took for me to get to the top. That means I should be half way down by now! Something inside me yearns for the hope that I will get to stay high up on the mountain to work and to enjoy the view for a good while longer and that the best way down will be to drop off a cliff when the time is right. So back to the question that was popped to my dad 30 years ago and was mine to field at a time when I perceived myself very much a youth, “What does it feel like to be an old man?” Well, I could begin by mentioning the various kinds of “itis” that seem to constantly pop up somewhere in my body all of the time or to hang around like mosquitoes or deer flies on a muggy day. It’s kind of like farting. Some people seem to get a certain pleasure out of yammering about their aches and pains just like they do--well you get the idea! But it is best not to do it any more than you have to because most people would rather not hear it anyway.